Make yourself at home in one of the 41 air-conditioned rooms featuring kitchenettes with full-sized refrigerators/freezers and microwaves. LCD televisions with satellite programming provide entertainment, while complimentary wireless Internet access keeps you connected. Conveniences include safes and washers/dryers, and you can also request irons/ironing boards. Satisfy your appetite for lunch or dinner at the hotel's restaurant, El Mirador, or stay in and take advantage of the room service (during limited hours). Buffet breakfasts are served on weekdays from 7:30 AM to 10:30 AM and on weekends from 8 AM to 11 AM for a fee. Featured amenities include a 24-hour business center, express check-in, and express check-out. Planning an event in Madrid? This hotel has facilities measuring 1291 square feet (120 square meters), including a meeting room. Self parking (subject to charges) is available onsite. Make yourself at home in one of the 99 air-conditioned rooms featuring flat-screen televisions. Complimentary wireless Internet access is available to keep you connected. Private bathrooms with showers feature complimentary toiletries and hair dryers. Conveniences include phones, as well as laptop-compatible safes and desks. Welcome to the Leonardo Boutique Hotel Madrid, your home from home in Madrid, within walking distance of Gran Via and the Puerta del Sol. Fill up on the nutritious breakfast buffet, drop by the bar for a drink and keep up to date with loved ones or work with the free Wi-Fi. The hotel also offers bicycle rental to discover the city in style. Each modern room is equipped with an en suite bathroom stocked with complimentary Sea of Spa products, coffee/tea maker, HD TV and mini fridge. 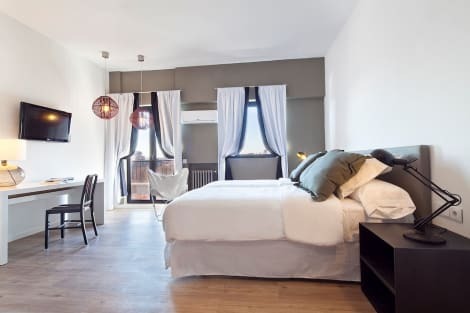 A modern apartment hotel in the north of Madrid, Aparthotel G3 Galeon offers stylish contemporary spaces a short walk from Santiago Bernabéu Stadium and within easy reach of the historic city centre. The bright, air-conditioned apartments come equipped with complimentary wi-fi access, satellite TV and fully equipped kitchen and living room areas. Start the day with a fresh continental breakfast, then catch up with work at the on-site business centre or work up a sweat in the fitness room. Featured amenities include complimentary newspapers in the lobby, dry cleaning/laundry services, and a 24-hour front desk. Planning an event in Madrid? This apartment features 657 square feet (61 square meters) of event facilities. Self parking (subject to charges) is available onsite.